How can cloud providers securely store cloud consumer data on cloud storage devices? Data stored in a cloud environment requires security against access to the physical hard disks forming the cloud storage device. Secure data on the physical hard disks in order to prevent unauthorized access. 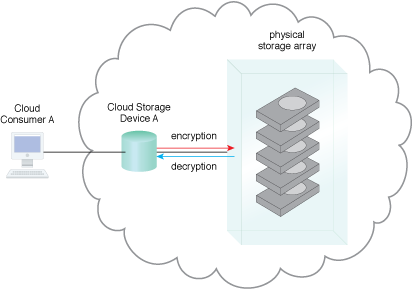 An encryption mechanism supported by the physical storage arrays can be used to automatically encrypt data stored on the disks and decrypt data leaving the disks. Data can be secured on physical disks by encrypting the data as it enters the physical storage array and decrypting data as it leaves the physical hard disks.